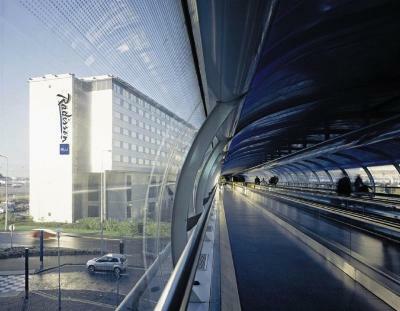 Lock in a great price for Radisson Blu Manchester Airport – rated 9 by recent guests! The view was lovely, room was nice and big. Very clean and staff were lovely. I considered missing my flight to be able to stay in this bed just a little bit longer- it was amazingly comfortable. The staff was very accommodating for an early check in. The executive lounge provided a good variety of drinks, though a better variety of snacks throughout the day would be appreciated. And of course the location cannot be beat- less than a 10 minute walk to the terminal. I will definitely book here again during my next stay in Manchester. The location. It was very convenient. 5 minutes walk to the Manchester Airport train station and terminal 2. 10 minutes walk to terminal 1 and 3. The bed was also very comfortable. This is the perfect hotel for those that have to catch a flight from Manchester Airport in the early morning. 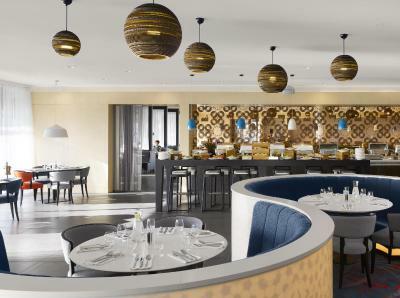 Location is what it’s all about with the Radisson Blu. Other than that it is comfortable but pretty standard. The bed was so comfortable. We stayed overnight before an early flight to Spain. When we checked into the Spanish hotel we realized we were spoiled. We could not help compare and there was no comparison! We enjoyed our stay, loved the runway view. Food excellent. So convenient. Beds were so comfy, pillows amazing and the food was delicious too. Gorgeous big room, modern, quiet and ideal for an overnight chill out after a flight. Lovely breakfast! Proximity to terminal two and it’s of a good standard. Location wise, so ideal for that quick walk into the terminals. Room wise, pretty good, all one needs for an overnight stay. Executive rooms very nice. 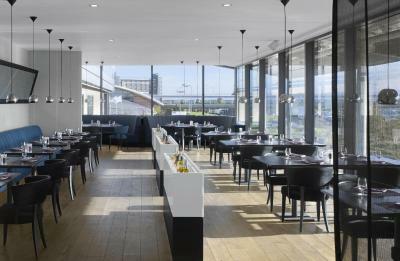 Radisson Blu Manchester Airport This rating is a reflection of how the property compares to the industry standard when it comes to price, facilities and services available. It's based on a self-evaluation by the property. Use this rating to help choose your stay! One of our best sellers in Hale! 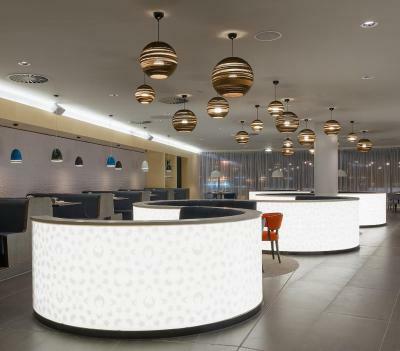 Offering access to all 3 of Manchester Airport’s terminals via the Skylink walkway, this stylish hotel offers chic rooms, free WiFi, and health club with a pool. 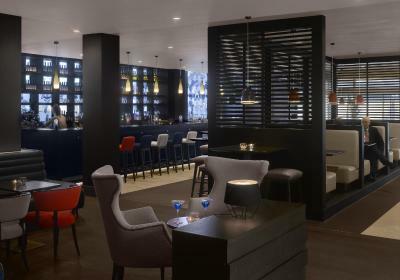 The rooms at the Radisson Blu Hotel Manchester Airport include a TV, mini-bar, safe and a 24-hour room service menu. 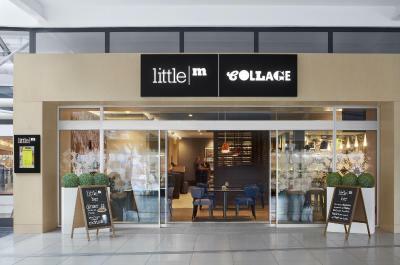 The hotel's Collage restaurant offers a modern British brasserie menu, featuring steaks, smoked haddock kedgeree and a classic British cheeseboard. 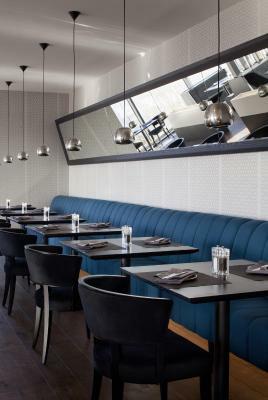 Desserts and an extensive wine list are also on offer. Guests can relax at the hotel’s Pace Health Club in the sauna or steam room. 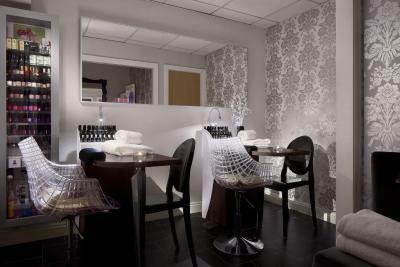 There is a fitness center and indulgent treatments available at the beauty salon. 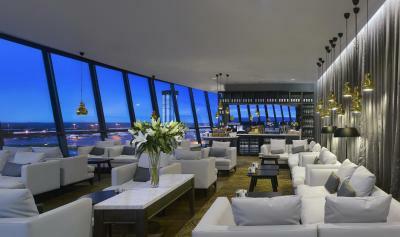 The stunning Business Class Lounge offers breakfast, drinks and snacks. On level 9, there is a private check-in facility. The Manchester Airport Station provides a direct link to Manchester. The hotel offers a variety of long-term parking options for guests. This property also has one of the top-rated locations in Hale! Guests are happier about it compared to other properties in the area. 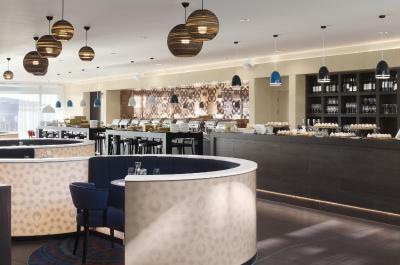 When would you like to stay at Radisson Blu Manchester Airport? 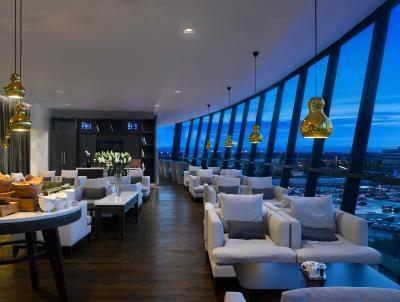 This room features views of the Manchester skylines. Additional amenities include complimentary in-house movies, bathrobe and slippers, daily newspaper. Public parking is available on site (reservation is not needed) and costs GBP 15 per day. This air-conditioned room features a flat-screen TV with satellite channels, a private bathroom with free toiletries, a hairdryer, a bathtub and a shower and a minibar. This superior twin or double room has an airport view included, a satellite TV, air conditioning, a mini-bar and bathrobes. It also has complimentary toiletries. This room features views of the Manchester and Cheshire skylines. This suite has a mini-bar, complimentary newspaper, air conditioning and satellite TV. The private bathroom offers bathrobes, slipper and luxury toiletries. These rooms consist of two rooms interconnecting double room with twin room. This air-conditioned room features a flat-screen TV with satellite channels, an private bathroom with free toiletries, hairdryer, bath and shower and a mini-bar. This Premium room features views of the airport runway Cheshire skylines. Additional amenities include Google Chrome cast, bathrobe and slippers, daily newspaper. 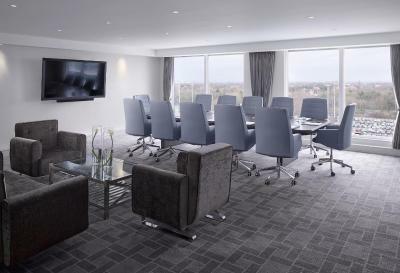 This Executive Class room features views of the Manchester skylines. Additional amenities include Google Chrome cast, bathrobe and slippers, daily newspaper and access to the hotel's Executive Lounge, which offers light snacks throughout the day. 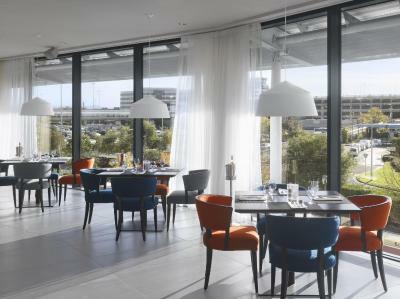 From 17:00 to 19:30 guests can enjoy drinks, canapés and light snacks, and relax into the early evening. Soft drinks, teas and coffees will be available throughout the day. A private check-in facility is available on level 9. Children under the age of 12 are not permitted in the Executive Lounge after 17:00. This Executive room features views of the airport runway Cheshire skylines. Additional amenities include Google Chrome cast, bathrobe and slippers, daily newspaper and access to the hotel's Executive Lounge, which offers light snacks throughout the day. This Executive Suite features views of the Manchester skylines. Additional amenities include Google Chrome cast, bathrobe and slippers, daily newspaper and access to the hotel's Executive Lounge, which offers light snacks throughout the day. 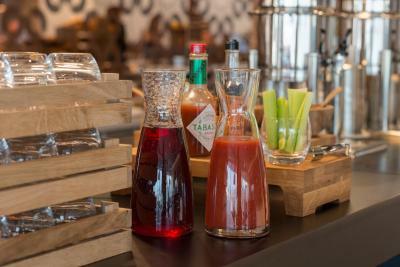 House Rules Radisson Blu Manchester Airport takes special requests – add in the next step! Radisson Blu Manchester Airport accepts these cards and reserves the right to temporarily hold an amount prior to arrival. The location is perfect right at the airport. The mattress was so comfortable together with the pillows and quilt - pure luxury- just what we needed after a long late flight! Highly recommended. Poor choice of bar meals. bathroom needed a full clean and room service food was average and expensive. Spotless, friendly, comfortable and very handy for airport! The water in the swimming pool was too cold. Was upgraded. Thank you, beautiful receptionist! Lovely room. The hotel is the best in the area and of course very convenient as you can walk inside to the airport. Went for eve meal. Staff very slow. Waited 20 mins and no one came to take any order. Had to ask someone. Then waited half hour for fish and chips. Great fish but chips not so good. Most were small end bits. Considering it was £18 each, very disappointing. On the whole, excellent stay and reception staff excellent. Rooms very comfortable. The price of a glass of wine in the bar was totally out of order £10.50 per glass..... really!!! !